UPDATE: 6/7/15 - A comprehensive Master-Model Dating Guide has been posted! One of my longer term projects is to develop a dating guide for the George B. Stone & Son Master-Model snare drums. We know that they were first introduced in 1922. And we know that they were produced through the at least the mid 1930s albeit in decreasing numbers after the company's prime in the mid 1920s. 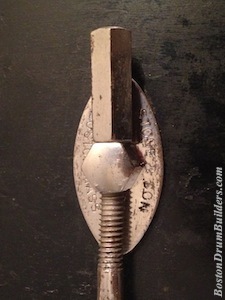 But there were changes made to the Master-Model's design over the course of that time, some more significant than others, which can be used to date a particular drum more precisely. One of the more apparent evolutions was that of the nuts used to tension the claws which tensioned the heads. 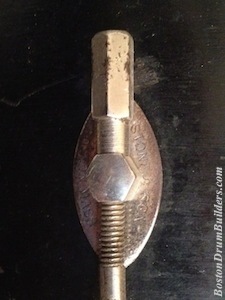 There were three clearly different versions of these nuts with more subtle differences within the second generation presumably from different batches of parts. Pictured below are the three easily definable generations with approximate dates based on the examples I've seen. Muddling things a bit, some drums appear with a mixture of second and third generation parts hence the overlapping dates. Do you have a George B. 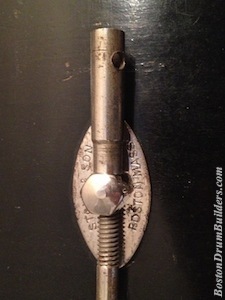 Stone & Son Master-Model drum? I want to hear from you! Send Lee an email at lee@vinson.net.